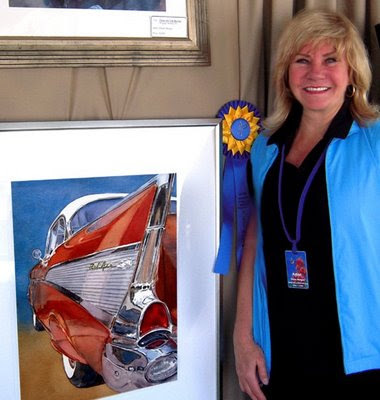 "Heaven is a '57" won first place for watercolor at this weekend's Indian Wells Arts Festival. I was so thrilled. It couldn't have been a more perfect weekend. Beautiful weather, beautiful setting, fantastic music and food.... lots of friends and well-wishers dropping by to say hello...not to mention sales :-} One of the best times of my life. Will be a great memory for years to come. What a feeling...I am so very happy for you and I feel like I won too by voting for you from 3 diff computers yes 3 diff names...Yeeppee! Congratulations! This piece is beautiful.They made a perfect choice. I sent one earlier but it didnt go through. Congratulations. It is a beautiful piece.The voters made a great choice. Congratulations Diane. Well deserved. This painting is absolutely fantastic. It seems that you have had a wonderful time - I am so happy for you!!! Thanks Doris, I've been reading the ArtColony blog, but haven't had time to comment on all the great new paintings. I'm totally exhausted today. Haven't even unloaded the car yet. Thank you Irit. You're so clever :-} You're vote is for a different competition...the American Artist magazine. The votes won't be tabulated til April 15th. Keeping fingers crossed! Thanks Liz. It was such a fantastic weekend. Words cannot describe. Congratulations, Diane! That is really great news! Wow Diane, what a wonderful show for you and what a wonderful honor to get a Best of Show. May I also say...You Look Marvelous...to quote Billy Crystal. I've voted twice for your Chevy on my e-mail accts. Yours is the BEST. Thank you Mollie! I only need 230 votes to beat number one :-} Yikes that's a lot of votes. Diane, congratulations on a great show, awards AND sales...WOW! Your site looked great, very professional...! Subscribe to my blog. Enter your email address here.